The near-paralysis of the negotiating function of the WTO has placed an unprecedented strain on the trading system that threatens to be more than just a lull in activity. The current inertia is driven not only by ailments intrinsic to arrangements in need of overhaul. The challenges facing the multilateral trading system are also symptomatic of rapid change and disruption in a broader global economic and socio-political context. 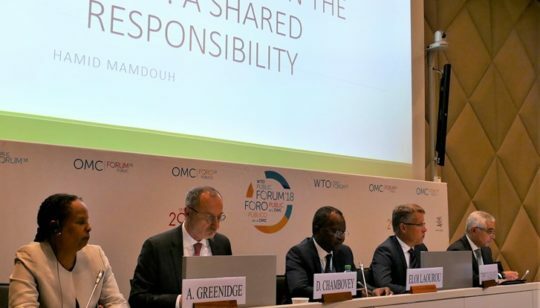 This confluence of challenges has led a growing number of governments and other stakeholders to call for reform of the WTO. The seriousness with which reform efforts are undertaken will be key in determining whether the WTO reasserts the historic centrality of its global role in managing international trade relations in the years ahead. A failure to tackle impediments to smooth and mutually beneficial trading arrangements among nations will undermine and ultimately reverse the extraordinary economic, social and political gains that have accumulated to countries through trade since the beginning of the second half of the twentieth century. Remedying today’s increasingly disruptive trade relations requires adaptation to new realities, as well as action to secure the sometimes neglected imperative of inclusiveness. The gains from trade must be shared to ensure progress and nurture development. That is a responsibility to be owned by the entire trading community. An inward-looking repudiation of the well understood economic gains from specialization will inevitably result in shrinking opportunity, lower incomes and growth, and significant risks of heightened conflict. An additional point of considerable importance is that trade policy cannot stand alone as the instrument of effective development. Trade policy is but one of many elements that determine the economic fortunes of countries. Policy coherence and good governance are fundamental pre-requisites of progress. These considerations weigh on all countries, not just developing ones. The aspirations of this paper are not so all-encompassing. We do seek, however, to address one of the most prominent challenges confronting the trading system – a challenge that is by no means of recent vintage. It is embedded in the very foundations of the post-second world war international trade architecture. Its origins are in competing perceptions of what constitutes an appropriate balance of rights and obligations among a highly diverse membership with different needs, priorities and aspirations in trade relations. The debate around this issue is often referred to in terms of special and differential treatment (S&D) 2. The S&D issue has frequently slowed and sometimes arrested progress in pursuing the GATT/WTO’s core objectives. This state of affairs can only be remedied if it is treated as a shared responsibility of all members, and not as a matter of ‘them’ and ‘us’. To view the original posting of this paper on The Permanent Mission of Sweden in Geneva’s website, click here. Copyright © 2019 Government Offices of Sweden. All Rights Reserved.